Add a sense of refinement to your home with the beautiful and functional Gwen glass front console table by iNSPIRE Q® Classic. The attractive, transitional design will match almost any decor style including modern farmhouse, Americana, or shabby chic. 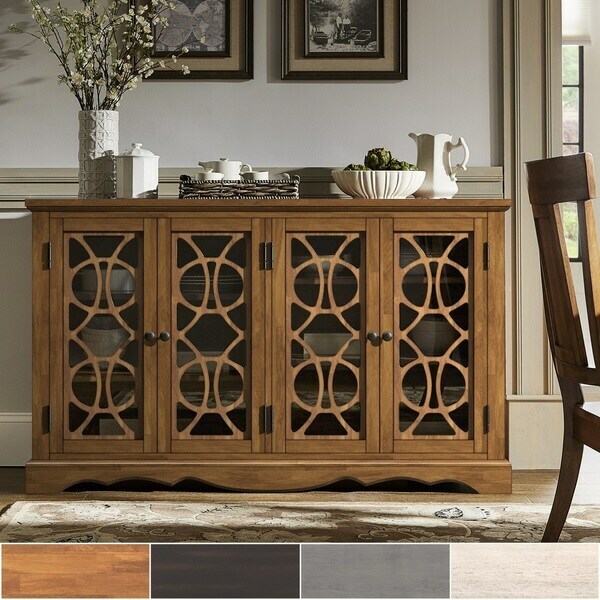 This piece works great in any room in the house; use it as a TV stand, entryway table, or buffet server. Featuring two spacious glass front cabinets with decorative wood framing. The cabinets include adjustable center shelves, so you'll have plenty of organized storage room. Available antique black, grey, white, and oak finishes. Love Love Love this product. My husband put together in about an hour. Great quality wood. Highly recommend this beautiful piece of furniture. I love the table buffet server so much! The wood is so nice and matches my dining table. I could now use the server for my upcoming birthday party. It will serve as the buffet table for food selection. This buffet server looks like it is going to last for a very long time. Sides didn’t go on correctly. All of the screw holes were misaligned. I contacted customer support and they gave me a very pitiful attempt at amending the situation. Wouldn’t suggest it. Beautiful cabinet. The color is is a medium oak - no honey tones. I would have preferred a little honey, but I suspect most wouldn't. You can see the contrast to the floors a bit in the picture below. It's a solid piece of furniture that looks beautiful in the dining room. I love my purchase! t took my husband about 2-3 hours to assemble. Some improvising was required due to poor instructions. It was a pain but not worse than most furniture assembly. A knob and a screw were defective, but the request from overstock came within a few days and was super easy to submit. Fortunately it did not impede the ability to put most of it together. A part from an early step would have been a painful delay. There was no damage to any of the wood, so the packing process was better than many we've experienced. This buffet table is beautiful. The wood came cracked and one of the doors will not stay shut. I contacted customer service so I will update my review once I hear back from them. Perfect size. Adds elegance to modern farmhouse dining room. Elegant and functional as well as contemporary. Well made of good material. Love it! Love this stand! Easy to assemble. Nice looking, very heavy piece, extremely difficult to assemble. Easy assembly. Looks like ‘real furniture’ not flat pack cheap stuff. "Is the antique white more of a white white or is it more of a cream white?" 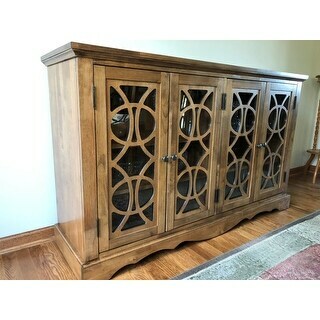 Classic stying no wine rack and it appears it will match other furniture i have. "What is the height of the shelving space and are the shelves adjustable?" The shelf height is approximately 0.78 inches and is adjustable. "The description states “assembly required”. How much assembly is required? " Hello, please visit https://www.overstock.com/downloads/pdf/25759490.pdf for assembly instruction. "Can this item be used for an entertainment center? Is there access in the back for electrical cords to go through?" The back is closed off. You can choose not to nail in a corner of the backing and be left with an opening for cords. "What is the weight of this item"
This item weighs approximately 158.4 pounds. To clarify, the shipping weight is 190.1 pounds and the actual item weighs 158.4 pounds. "The antique white looks more beige/cream in the picture. Is it more white or creamish?" I would describe the antique white as an off-white finish with a grey wash over it.